Health care providers caring for pregnant women and newborns are often faced with a finding of fetal hydronephrosis on routine screening antenatal ultrasound; in fact it is seen in 1 to 2% of fetuses screened. Previous guidelines have suggested that all babies with a finding of antenatal hydronephrosis should have a postnatal ultrasound done on day 3 to day 5 of life. This recommendation however may delay diagnosis and treatment of clinically significant urinary tract obstructive lesions; at the same time it may cause undue anxiety and over-investigation of other babies with benign conditions. To address this, a working group of physicians at BC Children’s Hospital and BC Women’s Hospital developed the following guideline for postnatal radiologic investigation based on published studies and expert local opinion. The guideline is meant to assure that no baby at risk of progressive kidney injury is missed in the immediate postnatal period, while allowing timely but less urgent investigation of other babies within the first month of life. Features of Posterior Urethral Valve. Other babies who have antenatally detected hydronephrosis without these concerning features should be evaluated between 3 and 30 days of age; and further radiologic follow up and the need for referral is guided by the findings on the first postnatal ultrasound. The following guideline has been approved (April 2015) as a Provincial Imaging Guideline. It is important to realize that this is a guideline for radiological investigation and does not include recommendations for clinical management. Divisions of Maternal Fetal Medicine1 and Medical Genetics2 of BC Women’s Hospital and the Divisions of General Pediatrics3, Pediatric Nephrology4, Pediatric Urology5 and Department of Radiology6 of BC Children’s Hospital. Still not clear on the second step in the algorithm for none severe findings. Do we do a renal US on all babies w/ mild/moderate hydropnephrosis between 48hour-30days of age? and then based on APD continue on with algorithm? 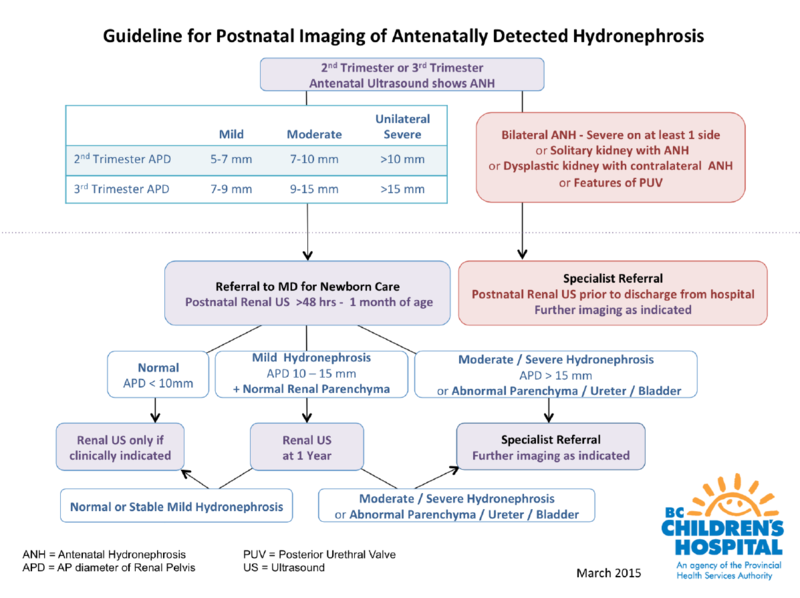 Yes – all babies with antenatally detected hydronephrosis should have a post-natal renal ultrasound. The difference is in the timing of the ultrasound: if concerning features present (e.g. bilateral/severe/features of PUV) then renal ultrasound should be done ASAP (ie. before baby goes home from hospital); if no high-risk features are present, it can be done as an outpatient in the first month of life. Thank you this is great. I will circulate to my obstetrical colleagues as we often the ones providing patients information about this when seen on their OB scans. Nice have the measurements as sometimes the radiologist summary can be misleading. Only do postnatal U/S if criteria met.for measurements in 2nd and 3rd trimesters. Thanks for providing algorithm. It will be nice if all Radiologists will report measurements instead of reporting mild or moderate.